Credit: Gemini Observatory/NRC/AURA/Christian Marois, et al. A K-band (2.2microns) AO image of the HR 8799 planetary system made using Gemini/Altair/NIRI and acquired on September 5, 2008 (North is up and East is left). The three planets are designated with red circles. The stellar flux has been subtracted using ADI (see text for details) and the central saturated region is masked out. Multiepoch observations have shown counterclockwise Keplerian orbital motion for all three planets. Credit: "Gemini Observatory Artwork by Lynette Cook"
Artist's conception of the multiple planet system, initially discovered with Gemini North adaptive optics images. Astronomers using the Gemini North telescope and W.M. Keck Observatory on Hawaii’s Mauna Kea have obtained the first-ever direct images identifying a multi-planet system around a normal star. 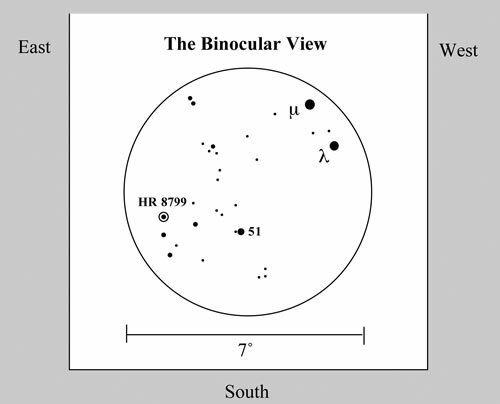 Binocular finder chart for the star HR 8799 in Pegasus. Click here to learn more about how Gemini is poised for the exploration of exoplanetary worlds beyond with current and future instruments like the Gemini Planet Imager (GPI) shown here. The Gemini images allowed the international team to make the initial discovery of two of the planets in the confirmed planetary system with data obtained on October 17, 2007. Then, on October 25, 2007, and in the summer of 2008, the team, led by Christian Marois of the National Research Council of Canada’s Herzberg Institute of Astrophysics (Victoria B.C., Canada) and members from the U.S. and U.K., confirmed this discovery and found a third planet orbiting even closer to the star with images obtained at the Keck II telescope. In both cases, adaptive optics technology was used to correct in real-time for atmospheric turbulence to obtain these historic infrared images of an extra-solar multiple-planet system. all we see are wiggly lines on a graph of the star's velocity or brightness. Now we have an actual picture showing the planets themselves, and that makes things very interesting.” The discovery article is published in the November 13, 2008, issue of Science Express, an international weekly science journal. The host star (a young, massive star called HR 8799) is about 130 light years away from Earth. Comparison of multi-epoch data show that the three planets are all moving with, and orbiting around, the star, proving that they are associated with it rather than just being unrelated background objects coincidentally aligned in the image. HR 8799 is faintly visible to the naked eye, but only to those who live well away from bright city lights or have a small telescope or even binoculars, see online finder charts here. The planets, which formed about sixty million years ago, are young enough that they are still glowing from heat released as they contracted. Analysis of the brightness and colors of the objects (at multiple wavelengths) shows that these objects are about seven and ten times the mass of Jupiter. As in our solar system, these giant planets orbit in the outer regions of this system – at roughly 25, 40, and 70 times the Earth-Sun separation. The furthest planet orbits just inside a disk of dusty debris, similar to that produced by the comets of the Kuiper Belt objects of our solar system (just beyond the orbit of Neptune at 30 times the Earth-Sun distance). In some ways, this planetary system seems to be a scaled-up version of our solar system orbiting a larger and brighter star. HR 8799 observations are part of a survey of 80 such young, dusty, and massive stars located in the solar neighborhood. The survey is using Gemini, the W.M. Keck, and VLT observatories' adaptive optics systems to constrain the Jupiter-mass planet populations in a range of separations inaccessible to other exoplanet detection techniques, i.e. separations similar to the outer giant planets of our solar system. Dr. Marois adds that this discovery was made after observing only a few stars, which may lead to the conclusion that Jupiter-mass planets at separations similar to the giant planets of our solar system are frequent around stars more massive than the Sun. Marois concludes that HR 8799’s planetary system will certainly be studied in great detail in the years to come, and it will surely be a prime target for future next-generation, exoplanet-finding instruments and dedicated space missions. (see background on Gemini planet-finding instrument program). More than two hundred exoplanets have been detected in the past decade, but almost all are known through indirect studies of their gravitational tug on their parent star. The indirect technique only measures the apparent receding and approaching velocity of the star, induced by a planet or planets around it, and infers the mass and orbit of the planet. “By making an image that shows the planet directly, we can study its properties in detail – measure its temperature and composition and try to understand its atmospheric structure,” said Dr. Bruce Macintosh, a scientist at the Lawrence Livermore National Laboratory, who has been co-leading the attempts to image an extrasolar planet for almost a decade. Up to now, only a few brown dwarfs (objects of masses in between that of stars and planets, also known as failed stars) and some ambiguous objects near or above the brown dwarfs/planets boundary have been detected by direct imaging. All of these objects are orbiting at large distances from their star and are not believed to have formed the same way the planets of our solar system did. Gemini recently imaged a large Jovian-like planet around the star 1RSX J160929.1-210524 but is awaiting further measurements of proper motion to confirm whether this 8-Jupiter-mass object is really in orbit around the star. The Gemini and Keck observations were possible due to the high angular resolution achievable with adaptive optics systems that significantly reduce the blur caused by Earth’s atmosphere. “Adaptive optics allow the large ground-based telescopes to match or exceed the performance of the Hubble Space Telescope,” said Dr. Macintosh. 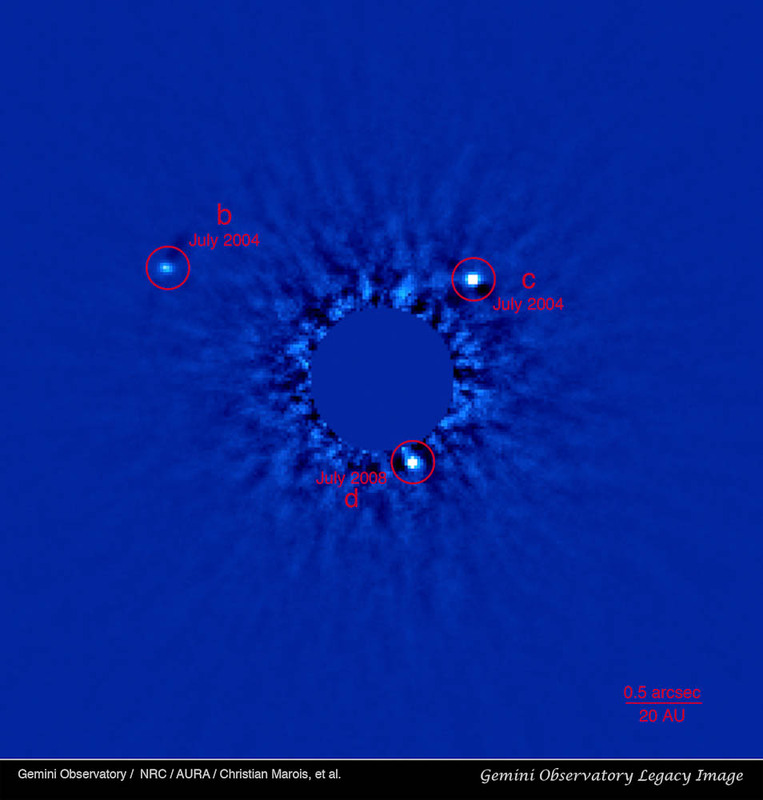 In addition, the detection of all three planets were made possible by an advanced observation strategy (called Angular Differential Imaging, see below for more details) that helps to separate the faint planet's light from the light of the host star. Analysis of available data indicates that the star is about 60 million years old. ”No one technique can yield a precise age for the star and its planets, so our age estimate is based on three independent lines of evidence that involve the spectrum and luminosity of HR 8799 and its motion in our Milky Way galaxy,” Zuckerman noted. Planets do not have any internal source of energy; they are thus slowly cooling down and becoming less luminous with time. 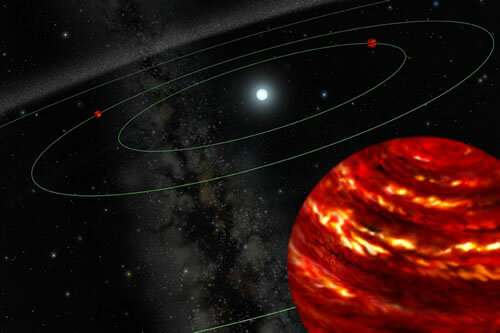 Co-author Travis Barman, an astronomer at Lowell Observatory, commented that “knowledge of the age of HR 8799 is critical for linking the observed luminosities of the planets with their masses. The younger/older are the planets, the smaller/larger would be their masses.” The derived luminosities show that the three companions are massive planets. “Detailed comparison with theoretical model atmospheres confirms that all three planets possess complex atmospheres with dusty clouds partially trapping and re-radiating the escaping heat,” Barman remarked. The Angular Differential Imaging (ADI) technique is a specialized observational and data reduction method that uses the intrinsic slow field-of-view rotation of altitude/azimuth mount telescopes to suppress (via image post-processing) the bright star light. The technique also suppresses noises associated with the atmosphere and imperfections in the optics of the telescope and instrument systems and reveal the light of faint nearby planets. 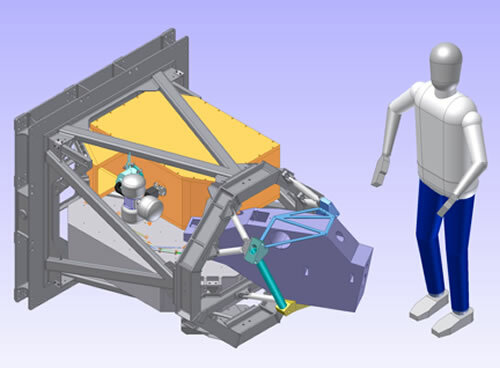 During an acquisition, the infrared camera is kept aligned with the telescope while the sky orientation is slowly rotating. A data reduction pipeline is then used to construct and subtract a reference star image that does not contain the flux of the planets. Residual images are then rotated to align the field and median and combined to enhance the sensitivity to planets.